Thailand’s Bangkok airport is the hub for most international flights to Southeast Asia; therefore, our itinerary included visits to the urban metropolis upon both arrival for and departure from a month-long trip to this fascinating part of the world, which for me included Myanmar, Laos, Vietnam, Cambodia, and Indonesia. This article is a compilation of both visits, beginning with my arrival from the United States. 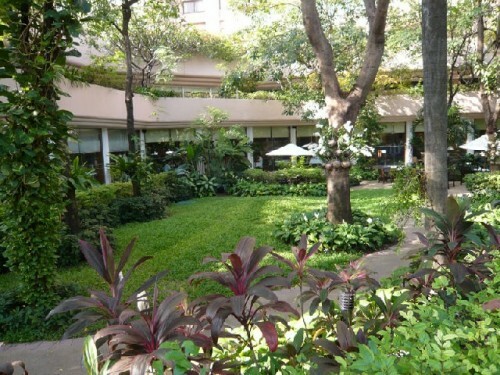 At the end of a long journey, the Pantip Suites Hotel offered a welcome respite with its lush gardens, soothing waterfalls, and charming statuary. The combination of the setting, along with an array of tropical fruits on the breakfast buffet, offered a glorious start to my first day in the city. 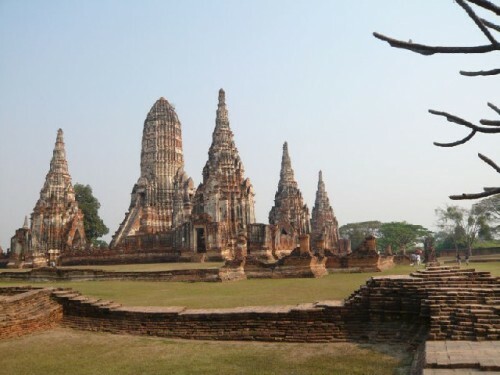 To become oriented in Thai history, I opted for the tour to Ayutthaya, a UNESCO World Heritage Site, which was the ancient capital for nearly 500 years and home to thirty-three kings from different dynasties between 1350 and 1767. 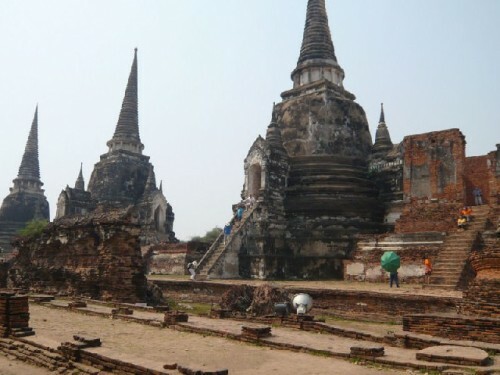 Ayutthaya is located on an island 47 miles from Bangkok. We traveled there by “Long Tail” boat — so named for its long, thin design. 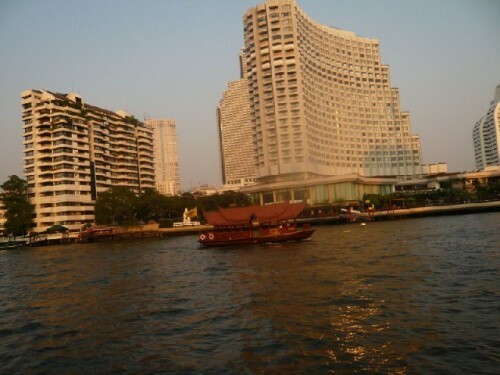 The hour-long boat ride on the Chao Phraya (King’s River) offered a glimpse into daily life by the water’s edge: the Royal Palace, the Queen’s house, ancient and new temples, a church, high-rise apartments, stilt-houses, children swimming, people feeding plump carp, and a variety of boats. 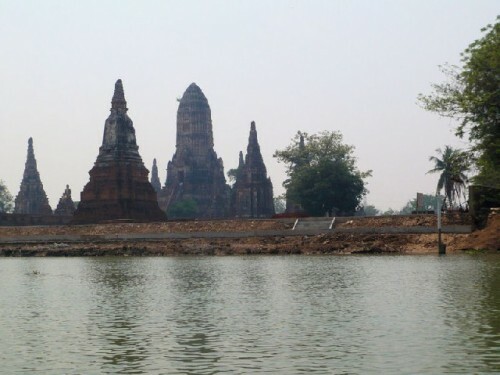 From a distance Ayutthaya resembled the ancient Khmer capital Angkor, ruled by god-kings with power mandated by divine forces. 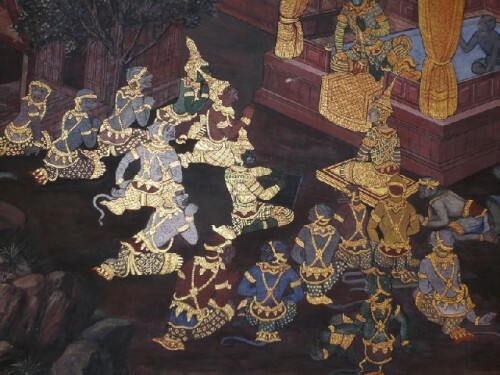 This was the model which had inspired the Ayutthaya monarchy. Disembarking at Wat Chai Wattanaram, we walked about the temple complex and the palace ruins, set in a spacious green park. Built in the mid-15th century, the palace was burned down by the Burmese in 1763. Little remains of the original grandeur of the Royal Palace; all but some scattered foundations has been leveled. However, the three temple complexes we visited — Wat Chai Wattanaram, Wat Mongkol Bophit, and Wat Phra Sri Sanphet — contained visually arresting ruins displaying the dominance of Buddhism in the development of Thai culture. 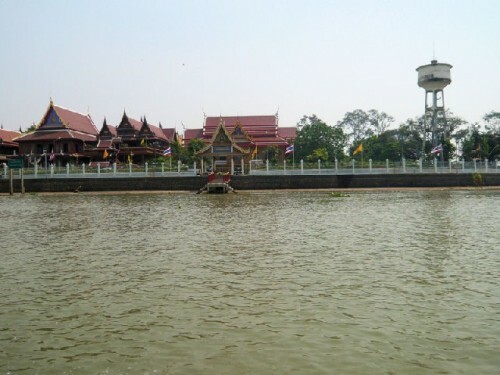 A wat, which is much more than a place of worship, has numerous buildings for specific purposes. 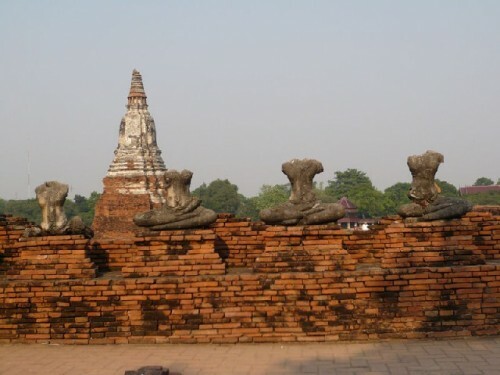 Brick chedis, which are bell-shaped stupas or pagodas with a conical top, dominate the grounds. 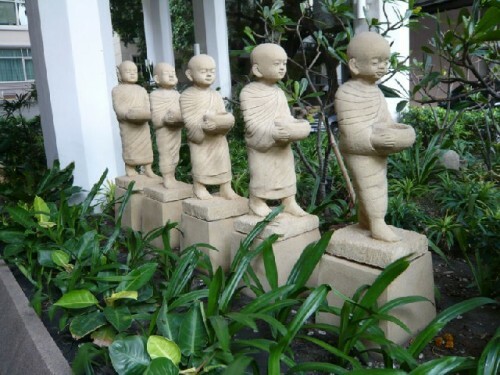 Raised on square or round terraces of diminishing size, chedis originally designed to hold sacred Buddha relics were later built to cover and commemorate the remains of kings and saints. 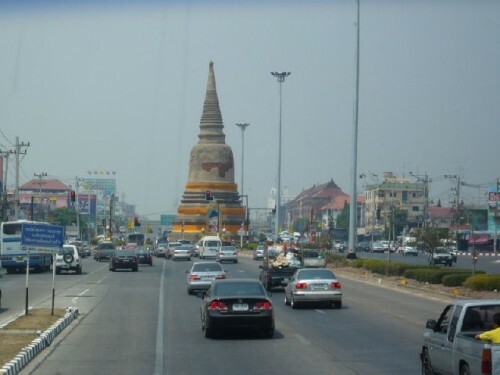 Prangs, also built for the same purpose, are soaring towers, slimmer in profile and more decorative than chedis. Their impressive stairways lead to ornate entrances. 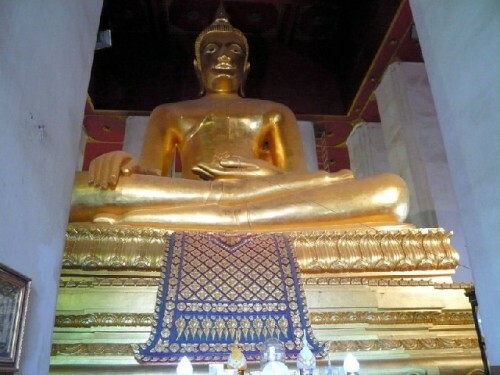 Wat Mongkol Bophit houses the largest seated bronze Buddha statue in Thailand. 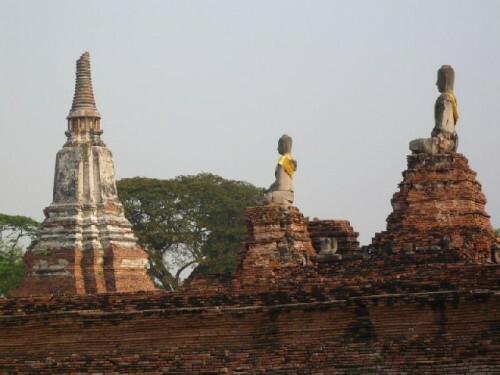 Wat Phra Si Sanphet was the royal temple-palace for some Ayutthaya kings, who employed the rituals of the Khmer royal court, carving a rigid, unapproachable divide between royalty and subjects. 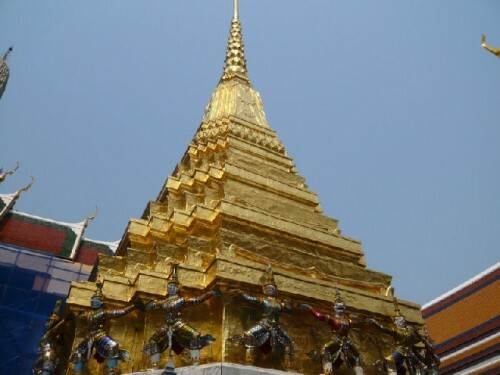 The wat was both a private chapel and a ceremonial courtyard for royalty, who would arrive on gilded palanquins from the nearby Royal Palace. Its three 15th-century symmetrically domed chedis, which stand on a long central platform, were built to enshrine the ashes of important kings. Our tour finished with a visit to the Elephant Camp. The elephant, Thailand’s national animal, has become endangered, with its population going down from 500,000 to 5000. Since the forests are depleted, elephants are now mostly used for entertaining tourists by giving rides, doing tricks, or dancing. 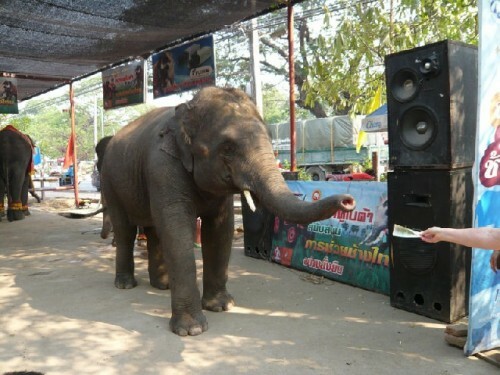 It was disheartening to see elephants trained to receive money from tourists by stretching out their trunks after a performance. 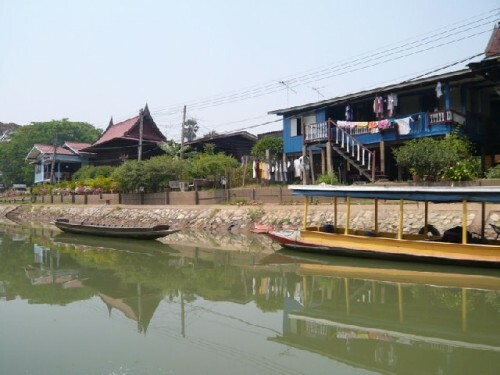 As we approached the outskirts of Bangkok on the way back, we cruised by slum houses alongside new constructions, which had attracted country people into the city for job opportunities, turning them into slum dwellers near where they worked. 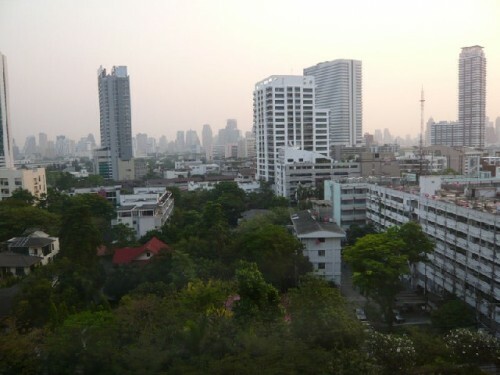 Thailand has a population of 64 million; the majority live near or around Bangkok, which is in the center of the country, surrounded by 76 provinces. The average annual income is $8000; there is 7% sales tax on all goods. 37% of the population work for the government, which provides them with a pension and free health care. Education is free and compulsory until high school. The literacy rate is 92%. 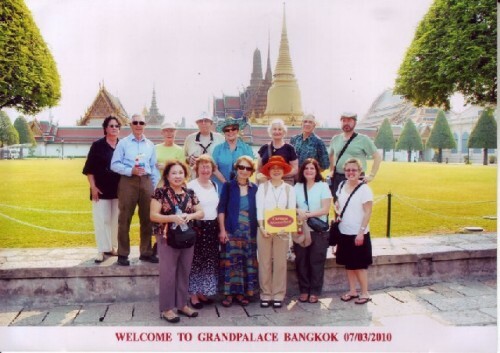 Wearing the proper attire — long skirt or pants, shoulders covered, and no hats — for the visit to the Royal Palace, we started off our second day in the city. On the way we visited Chinatown. 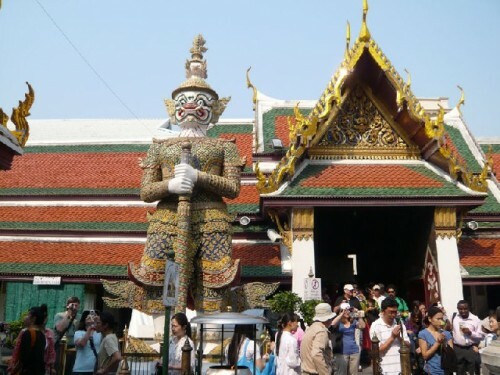 Of the 14% of Thailand’s population who are Chinese, 85% live in Bangkok’s Chinatown, famed for its temple with a Golden Buddha weighing 5.5 tons. 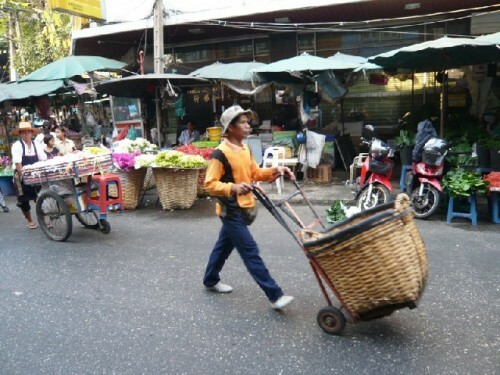 Walking through the market — open from 6 am until 11 pm — gave us a glimpse of this bustling neighborhood. 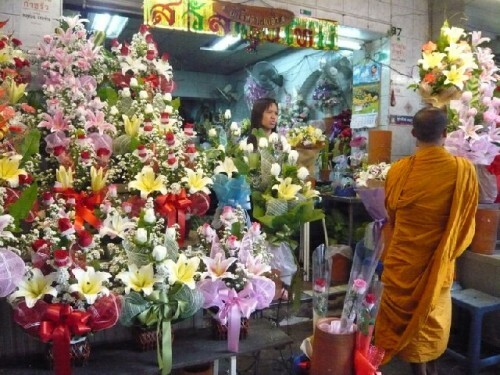 Open-air flower stalls — with jasmine garlands and offerings for Buddha, wedding bouquets, funeral wreaths, and a variety of orchids — provided intoxicating sights and smells. 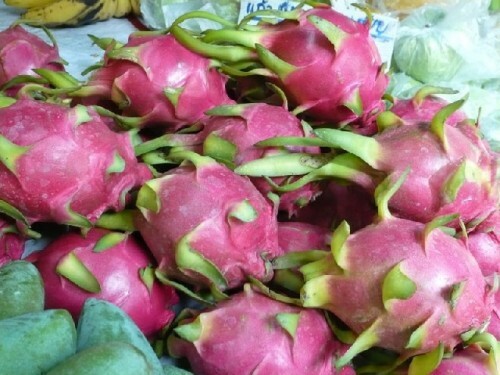 The jam-packed produce section offered a kaleidoscope of peppers, dragon fruit, lotus, lemon grass, packaged palm leaves, and other exotica. Similarly, a pocket of Hindu culture exists in Little India. 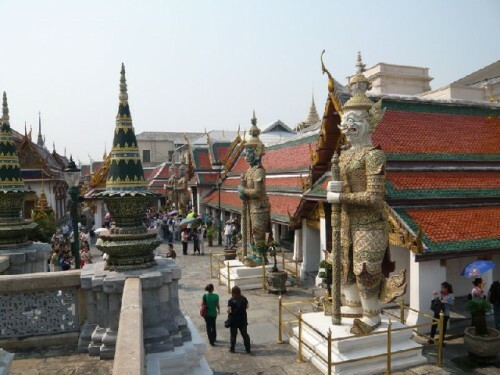 The Royal Palace and the adjoining Wat Phra Kaeo is the most dazzling sight in Bangkok, which became the new capital of the Kingdom of Siam, founded in the late 18th-century after the fall of Ayutthaya. 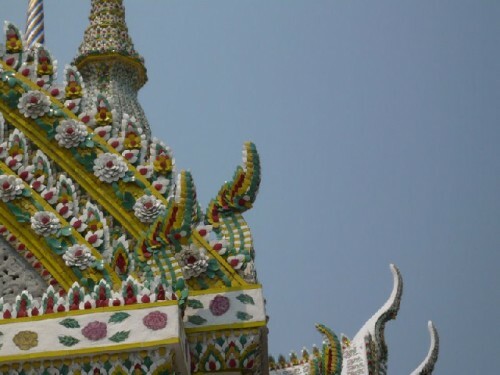 The temple and palace grounds are filled with a number of other splendid buildings and sacred structures adorned with exquisite carvings, gold leaf murals, gilded towers, and ceramic mosaics, the sum creating a riot of color. 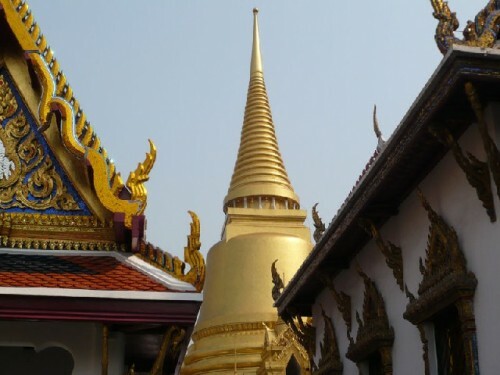 Buildings are closed to the public, with the exception of the bot or chapel of the Emerald Buddha, a most holy statue and a symbol to the Thai people of the power, divinity, and enlightenment of their country. The image, actually carved from green jade, is only 26 inches tall, and is called “emerald” because of its color. Photography is prohibited, and visitors must remove their shoes before entering. 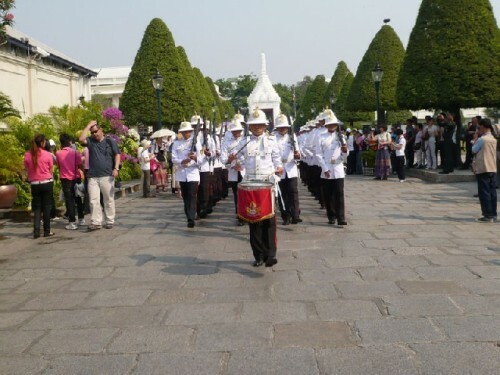 The palace, which has not been a royal residence since the absolute power of the monarchy was dissolved in 1925, fulfills a purely ceremonial function. 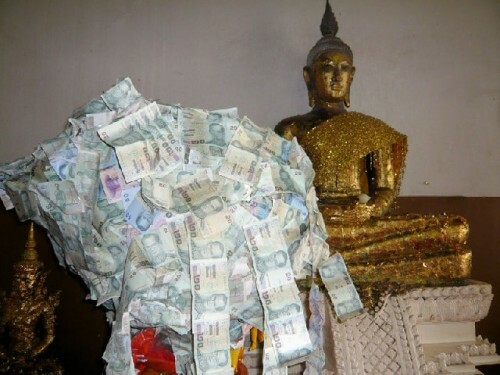 In Thailand, which means “Land of the Free,” there are 30,000 temples; 95% of the population are Buddhist. The King is the lord; negative comments about the monarchy are punishable by law. The current King, Bhumibol (Rama IX) — born in 1927 in Cambridge, Massachusetts, where his father was studying medicine at Harvard University — is the longest-reigning king in Thai history. At 83, he is frail, but pictures of him at a young age are everywhere: temples, streets, schools, shops, and homes. People do not want to see the aging king, whose daughter is in line to be queen. 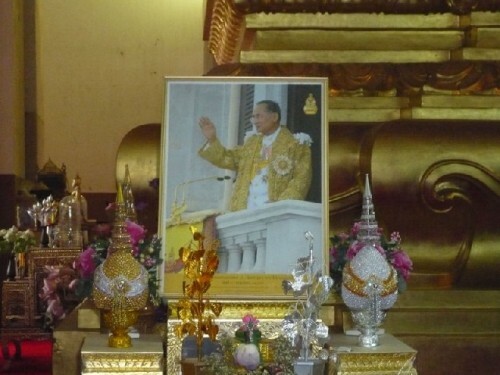 Since 1992, when elections were held to democratize Thailand, the king’s status has been ceremonial. 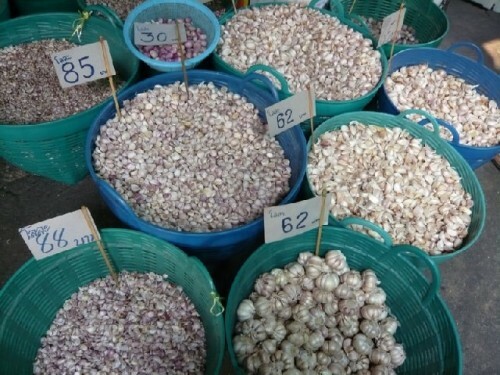 After an enjoyable lunch — served on a stationary boat on the Chao Phraya River and consisting of coconut dumplings, rice noodle soup, fried chicken with cashews, fish in cream sauce, and salad, followed by fruit — we visited two well-known Bangkok shops: the Gems Gallery and Thai Square Fashion. The Gallery displayed jewelry made of Thailand’s famed sapphire and ruby, in addition to other precious stones. Following a brief video about gems, each one of us was escorted by a salesperson, who felt compelled to talk at the slightest pause in front of a display case. Not inclined to buy expensive jewelry, I felt overwhelmed by the experience. The stop at Thai Square Fashion was an opportunity to order custom-tailored pants and shirts at a fraction of what they would have cost back home. We also had a demonstration of the difference between organic silk fiber and synthetic fabric. Exposed to a lit match, the former burned like hair, while polyester fabric gave out a rubbery smell. 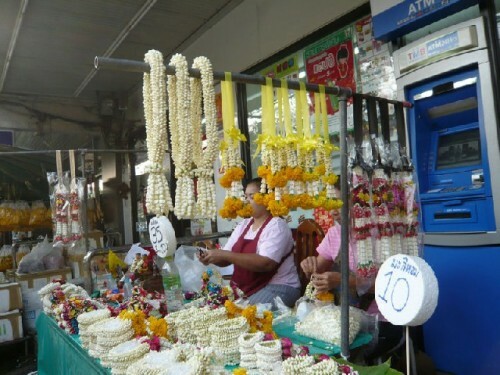 I opted to wait for something authentic rather than buy Western-style clothes from Thai silk. I was ready for a swim in the hotel pool, as the temperature in Bangkok begins with hot and then becomes hotter and hotter, depending on the season and time of day. 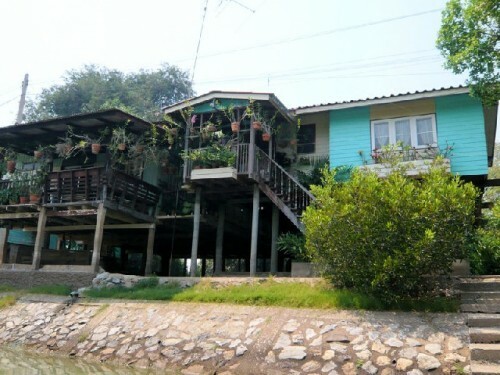 The next morning we flew to Luang Prabang in Laos, returning to Bangkok three weeks later from Siem Reap in Cambodia. 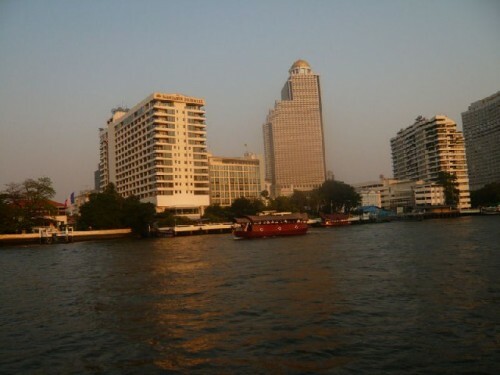 On our final evening in Bangkok, we enjoyed our farewell dinner on a converted wooden rice barge during a sunset cruise on the Chao Phraya River. The dinner menu included clear soup, chicken curry, stir-fried vegetables, Thai omelet, and sticky rice with mango wrapped in palm leaf. 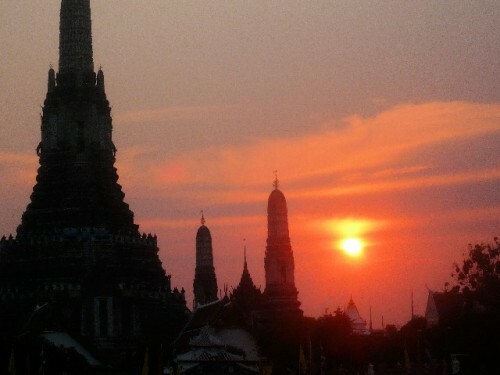 We cruised past the Royal Palace and Wat Arun, also known as the Temple of the Dawn, which looms 286 feet above the river’s west bank. 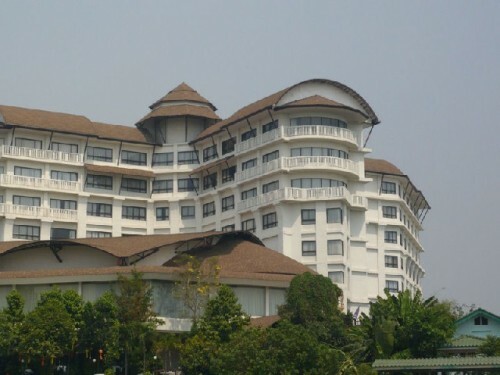 Built in Khmer style, the towering prang represents Mount Meru, mythological home of the Hindu gods. Its silhouetted form at sunset was a spectacle to behold. 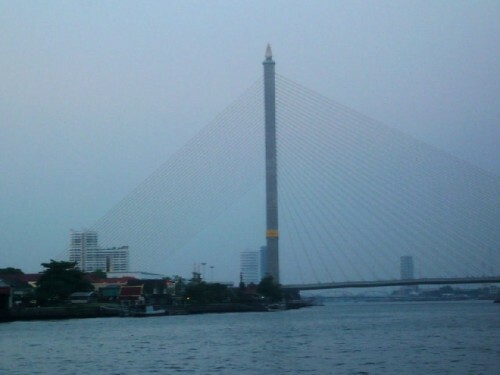 My first visit to Bangkok had been in 2002. I remembered it as a steamy, crowded, noisy urban sprawl with maddening traffic; I could not wait to get to the mountainous north and the beaches in the south. 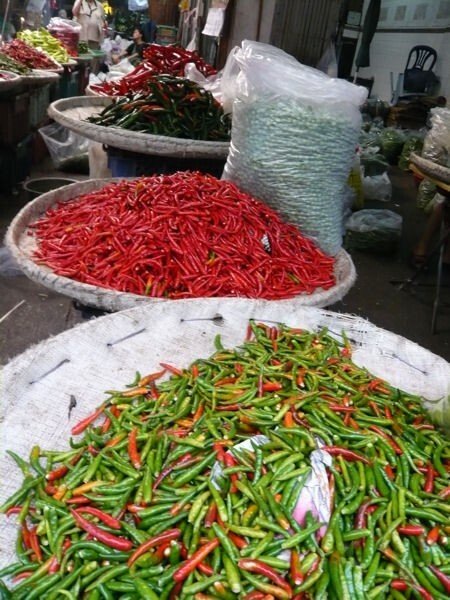 While those areas of the country definitely merit a visit, my experience in Bangkok eight years later led me to appreciate Bangkok, despite its daunting aspects, as one of Asia’s great cities. It is rapidly changing with modern high-rises and shopping centers; yet the city’s historic sites, intriguing and culturally rewarding ethnic enclaves, ornate art and architecture, lively night life, riverfront attractions, and rich cuisine combine to provide full enjoyment. Thanks to the new spacious airport, going into and out of this great city are no longer the frenetic experience it used to be. Witnessing this, I flew to Denpasar in Bali, while the rest of my group returned home.